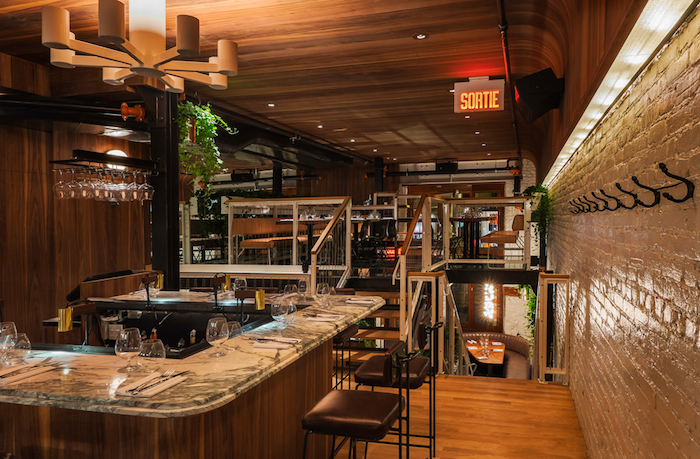 Last night a select group of Montreal’s nightlife aficionados were invited to Lea, Westmount’s swanky new restaurant for a sneak peek at their cool new space and menu. Lea is the third offering from the guys who broke ground on the Plateau with Hachoir and built a strong foundation in Griffintown with Grinder. With their restaurants, they have set space and design standards sky high with their one-of-a-kind designer spaces, out-of-this-world food and excellent service. Upon our arrival, we were greeted with a spicy lemonade cocktail before being led on a quick tour around the restaurant. We were among the first to see the new jaw dropping space that rises from below street level and climbs all the way up two more floors. The space was conceived by celebrated designer and architect, Zébulon Perron. He has designed some of the most influential nightlife hotspots in the city including Plan B, Philémon, le Buvette chez Simone and more. 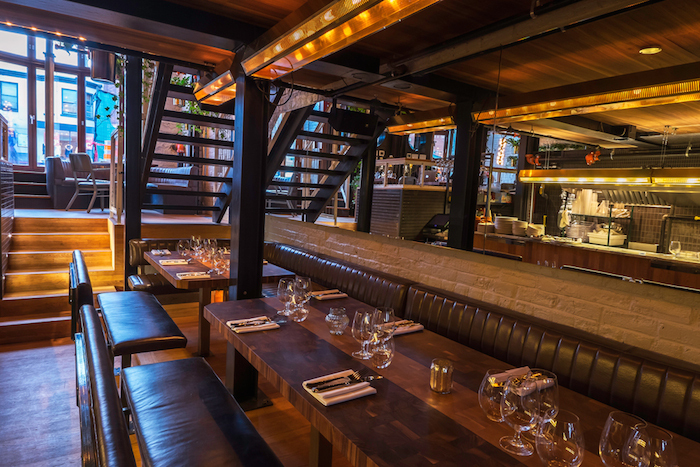 After also collaborating with the owners on Hachoir and Grinder, they have once again outdone themselves with an eclectic space, complete with a partial glass floor that will certainly be the talk of the town. Each section of the restaurant is divided for the ultimate, intimate dining experience. Using materials like lush leather, hard wood, cabling, ceramic and concrete in a setting that feels like an Escher painting, there’s no shortage of curves, straight lines and spilt levels to keep the eye occupied. Each level is divided into cozy sections that are completely unique while subtly winking at elements found in the other restaurants in the family. Taking our seats, we were treated to a variety of Portuguese and Spanish-inspired dishes from Lea’s extensive menu during our 3-hour sitting. We got the ball rolling with a delightful terrine de fois gras with paprika, caramelized onions and crostini. With whetted appetites we sauntered slowly through courses featuring crunchy chili-cinnamon prawns, a savory grilled endive salad and a unique take on falafel (with crab and green peas). 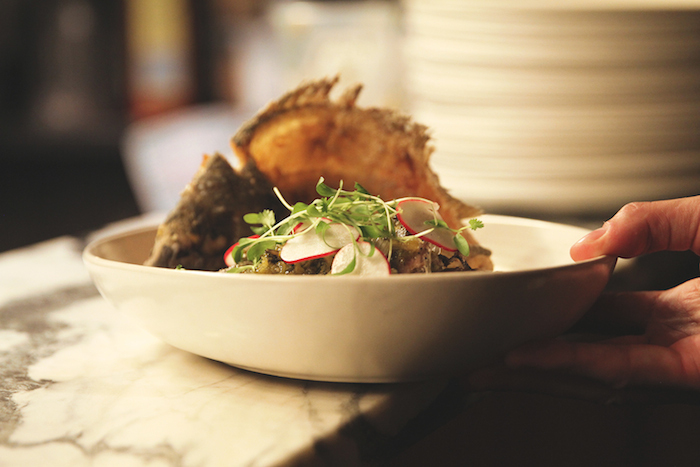 We continued our meal with a crisp fried dorade (pictured above), which came topped on a bed of creamed corn and sides followed by a delicious braised lamb shoulder (pictured above) in a chili-espresso sauce, pecans, pickled cucumber, arugula and fingerling potatoes. 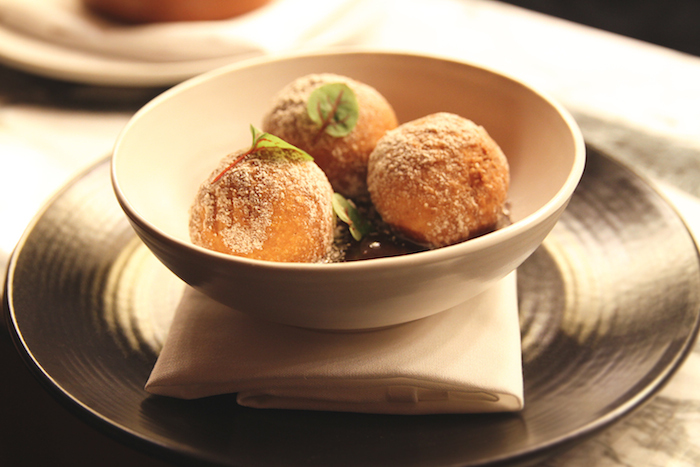 Lea then punctuated the tasting with a serving of churro-style donuts in Nutella (pictured below). The food was a great introduction to Lea’s menu and I am excited to see what they come up with in the future. The head chef assured us that he plans on keeping us all on our toes. Due to the success of this group’s previous restaurants, the buzz around Lea has been building for months. The intimate eatery, however, wont have to worry much about meeting the expectations of Westmount or the rest of the city. 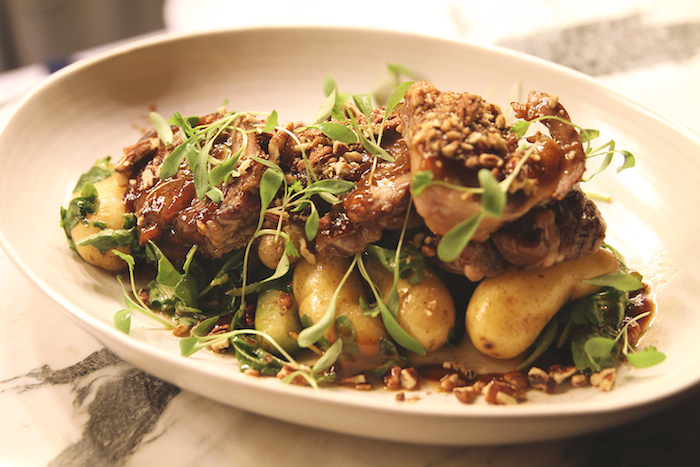 Their cool, ultra-modern atmosphere and variety of food will exceed expectations on every level.